Want the 2015 Cadillac Escalade with 557 horses and a slightly more agile and aggressive appearance? Just drop an additional $16k for the HPE550 upgrade by Hennessey. 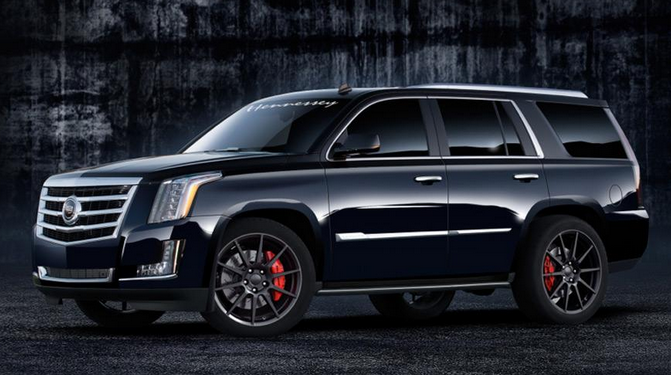 The Hennessey Escalade is yet another beautiful example of what happens when Hennessey Performance Engineering gets a bright idea. The 2015 Hennessey Cadillac Escalade is bumped up to 557 horses riding on 20’s. Do we like? Aston Martin has been diligently marketing the hot new V12 Zagato, and recently revealed that they will make just 101 examples of the sports car. Initially, there were to be 150 units made by the UK carmaker, but it seems that sales failed to skyrocket as hoped. Which will fare better, the V12 Vantage or the V12 Zagato (Pictured above). Secret Aston Martin Concept Caught Sans Camouflage! Luxury car brands are typically good at making amazing exotics…and keeping the concept cars under wraps until the right auto show springs up! Lucky for us, they do sometimes slip, like Aston Martin recently, when the cover slipped from the next model! This is rumored to be the DB9 replacement with quite a few alterations and a name switch. How Much For an Aston Martin GT4 Racecar? If you have your sights set on the fabulous 2012 Aston Martin GT4 racer, you have awesomely aggressive taste in fast track cars! With the Aston Martin V8 Vantage primed and successful, the good people at Aston Martin were free to tweak the GT4---to the tune of $190,000 USD. This is actually a surprising figure from a brand with many cars worth around a half a million and up…you definitely pay for that glorious Aston Martin badge and engineering! We all know that Facebook is extremely addictive, but Aston Martin has taken social networking to extremes by developing a special car to celebrate the fact that it has a million fans on Facebook. Yes, I am serious. While we are on the subject, like Imagine Lifestyles on Facebook...end shameless self-promotion. Does the Aston Martin Bulldog GT Concept Have The Bite to Back Up that Bark? The new Aston Martin Bulldog GT luxury car concept has emerged, unleashing a devilish 666 barking dogs. Developed by Danish design firm HBH, the Bulldog GT is all about increasing power while maintaining that seemingly never-changing Aston Martin appearance. A few months ago Aston Martin rekindled its romance with an old flame, Zagato and produced a luxury concept car that forces you to stare! This is a hot match, as Zagato Italian design house produces impeccable concepts and engineering, so I more than approve of the naughty romance.